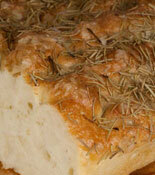 Our focaccia dough is enriched with extra virgin olive oil for flavor and satisfying texture. Topped with rosemary and salt. Also available with no topping.